What happens after a brainstorm? So now you’ve fleshed out your ideas by yourself or with a team. It’s been many minutes or even some hours. The time has flown by faster than the ideas from your head into the real world. Now it’s time to take those ideas and distill them into something useful. If you haven’t read our post about mindful brainstorming, we highly recommend it. It’s a great place to start before reading this article. All too often, ideas fly through our heads and onto paper or a note-taking app, but are never developed further. Whether you are a social media marketer, famous on Instagram, or you are trying to build your own brand, the steps you take after freely expressing your ideas are crucially important. More important than the exact steps you take is actually putting aside the time to take them. Don’t let other small tasks get in the way of what is important to you. In the words of Tim Ferriss from The 4-Hour Workweek,, “Being busy is a form of laziness - lazy thinking and indiscriminate action.” It’s easy to get distracted by other things that arise in your life that seem more important than developing this idea. After the manic excitation associated with the genesis of these original ideas has fizzled out, it can be difficult to keep going. We challenge you to keep it up and don’t give in. The feeling will return if you push through. Many of these ideas will never see the light of day for hosts of reasons. It’s up to you to identify which ones are solutions and which ones are best swept off the drawing board. Now that you understand how important it is to take these next steps, we can discuss three options for actions you can take. We will keep these as broad as possible so you can apply them to most areas, so you can get the most out of these techniques. Visualization of concepts and action is powerful for two reasons. One, it trains your brain to become better at creating images to represent ideas that may or may not be concrete. This skill is useful for the creation of just about anything visual, whether it’s a Facebook advertisement or a creative hobby. This action also increases the response for the second power of visualization, which comes from the realm of Neurology. It is a well-known fact among scientists in this field that the visualization of the movement of a limb lights up the same areas of the brain that are used when the limb is actually moved. Visualizations allowed nationally-ranked Stanford gymnasts to perform (for the first time) several complex tricks and sequences that they had been working on for over a year. Try to think through and imagine visually each of these ideas in their fruition. Think as positively as possible. If you keep at it, you’ll add onto ideas that are possible and realize that other ideas really just won’t cut it. You can come up with the most spectacular idea that you think will change the world, but if nobody else thinks so, will it really? It’s important to get the honest opinions of others. Don’t go around only asking your close friends and family for advice, for they may be too nice in their evaluations. It’s important to get constructive feedback by many people from varied disciplines and backgrounds. Be very careful about how you ask for constructive feedback because it can have a large effect on the quality and quantity of the advice. The acronym “SWOT” stands for strengths, weaknesses, opportunities, and weaknesses. It is a great way to see many aspects of an idea at once. 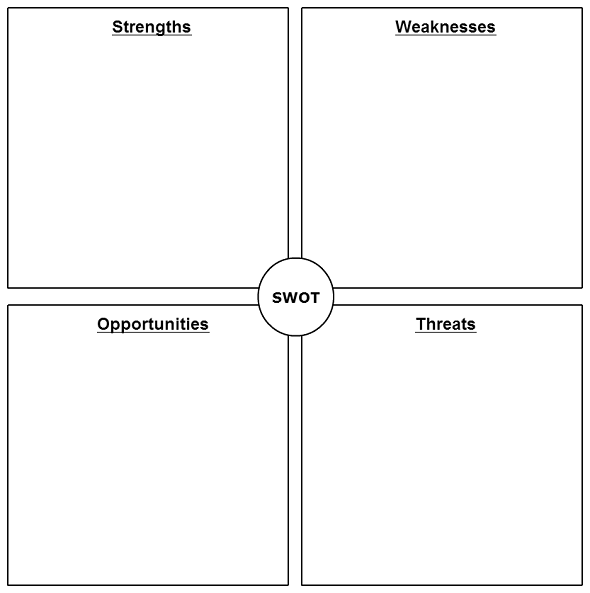 You can print a free SWOT chart here. Strengths are the ways the idea can begin benefit you after it has been put into action. Weaknesses are areas in which the idea may fall short. Opportunities are how the creation of the idea may benefit you in future scenarios. Threats are how the idea may hurt you in both the short term and long term. Try to make a SWOT chart for each idea and list as many strengths, weaknesses, opportunities, and threats as you can. Try to think back to the excitement you felt when you first came up with the idea. Let that energy fuel the seed as it grows and develops into actionable steps that you can use to make a difference in your work, your personal life, and your relationships. Try one or all of these techniques to refine your brilliant ideas. Which technique did you like the best, and why?